It was another easy win in the end for United who played half of the match against ten men. As you would expect with the numerical advantage, the reds were dominant in all areas and, happily, improved their goal difference significantly; something which they should have done against ten man West Brom at Old Trafford last week. Perhaps with that in mind Sir Alex announced a very attacking line-up. 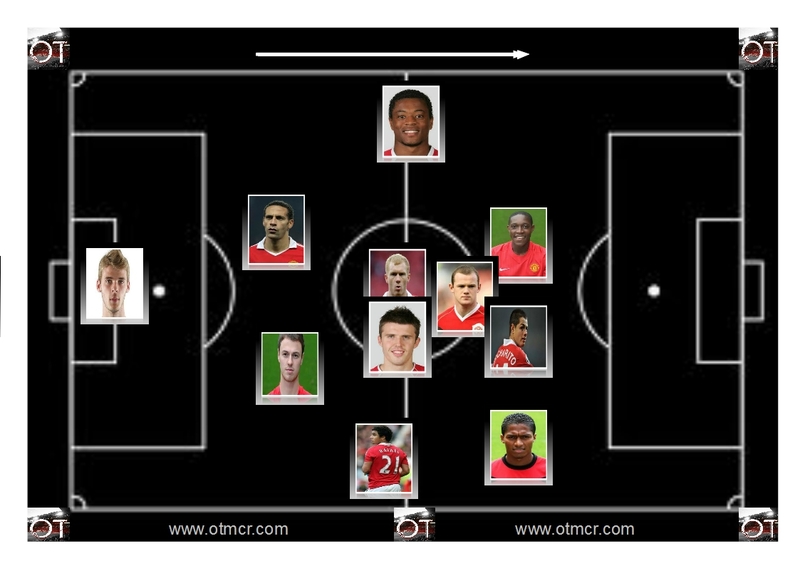 On paper it looked like a 4-4-2 with Welback stationed on the left wing. In fact it was a variation on 4-3-3 (as we saw last week) which saw Rooney drop in behind Chicharito and Welbeck, and Valencia bombing forward in support on the right. Little came down the left flank, in fact United hardly utilised this area of the pitch at all. From the graphic above we can see a Rooney sitting in between the lines, with Welbeck deserting the left wing entirely for long spells. Valencia worked the right wing wonderfully today - creating 6 chances - and was a constant threat while on the left Evra provided what little width there was. Fig 2 shows Scholes impressive passing (click to enlarge). In the middle of the pitch we saw the now familiar shape that Carrick and Scholes have imposed since they were re-united back in January. It was in no small part down to those two that United completed 553 passes. Scholes himself was responsible for 96 of them (out of 98 attempts) while Carrick managed 48 in his 57 minutes. Since Scholes came out of retirement United have gone from averaging 436.5 passes completed per game to over 560 as we analysed in a previous article. The midfield maestro may well prove to be the signing of the season. He has certainly made a significant impact in United's title challenge. While many reds still bemoan the lack of a major midfield purchase in the transfer market, there is no doubt that Scholes is still more than just 'up for' the challenge of the premier league. Today, along with Rooney and Valencia, the ginger veteran was instrumental in winning the three points. Of course Wolves are not exactly Barcelona but to win titles teams like Wolves have to be beaten too. Over the past two months, Scholes has played key roles in victories over Bolton, Stoke, Liverpool, Norwich, Spurs West Brom and now Wolves. Far from being a desperate signing, as some in the media coloured it, the signing of Scholes has been a smart one and one that has kept United in the hunt.